'It's Definitely Easier To Engineer For An Earthquake' Than Tornadoes : The Two-Way Can homes, schools, hospitals and office buildings be built to be tornado-proof? After the death and destruction we've seen in recent weeks in Joplin, Mo., and Tuscaloosa, Ala., that is likely on many minds. But an engineer lays out the difficulties. In Joplin today: Some of the destruction. 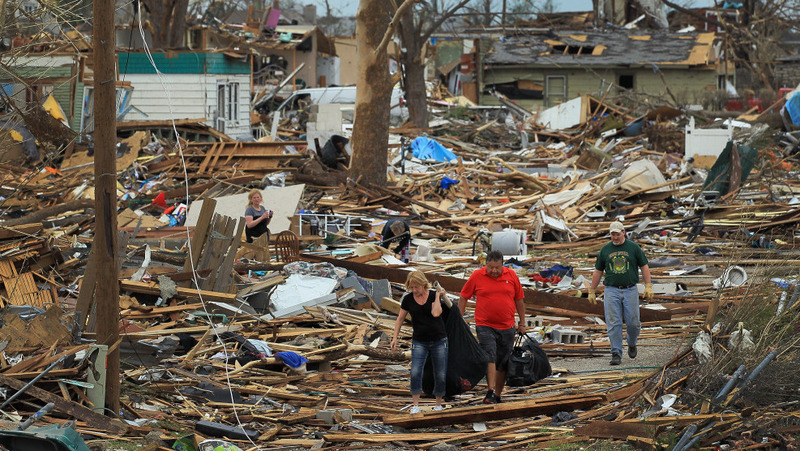 Can homes, schools, hospitals and office buildings be built to be tornado-proof? After the death and destruction we've seen in recent weeks in Joplin, Mo., Tuscaloosa, Ala., and other parts of the nation where tornadoes have struck, that is likely on many minds. This afternoon, All Things Considered host Robert Siegel put the question to John W. van de Lindt, a civil engineering professor at the University of Alabama (in Tuscaloosa), who has extensively studied the effects of tornadoes on structures. Looking at the damage in Tuscaloosa, van de Lindt said it was apparent that buildings constructed with a "continuous load path" (in which structures are bolted to their foundation and metal hardware goes all the way up and connects to the roof) fared better. But the most powerful tornadoes, with winds up to 200 mph, will rip off almost any wooden home's roof, he said. Once that happens, "the building is no longer stable and it blows the walls down." By the way, it's also a myth, he said, that you should open your windows. That will only increase the upward pressure on a roof. It's critical, van de Lindt said, that residents have — or can get to — storm shelters or an "inner core" where there's a closet or a bathroom that offers some protection. And it's especially critical, he added, that they not wait to actually see the funnel cloud. By then, it's way too late and the twister may be headed in their direction "at about the speed of a car on the highway." Unfortunately, van de Lindt noted, many of the people in Alabama (and, it's likely, in other places) wanted to stay home until what they thought was the last possible moment in case the tornado passed them by. As for the forces that tornadoes can bring to bear on a building, van de Lindt said "it's definitely easier to engineer for an earthquake." "A tornado works from the top down," he said. And it's especially difficult to keep a roof attached to a typical house if a major tornado hits it. An earthquake works from the bottom up, and a foundation can be built to withstand great force. Much more from Robert's conversation with van de Lindt will be on today's edition of All Things Considered. We'll add the as-broadcast version of the interview to this post later.